We were contacted by Police about a couple who had become lost somewhere in the Middleboots Knotts area on Scafell Pike whilst trying to get off the mountain. It was now dark and they were unable to find the path. 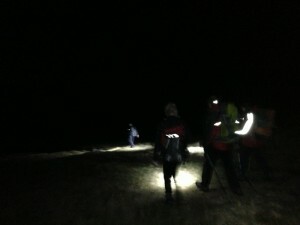 Attempts were made to get them moving again but in the end a callout was mounted to find and bring them off the hill. They were found between Middleboot Knotts and the Corridor Route and walked back to Wasdale. We have them a lift back to our base before they got a taxi back to their car in Borrowdale.